The annual Christmas baking battle is set to begin in my kitchen in a matter of hours and I can safely say that, this year, I’m well-armed and ready to tackle my long list of must-makes. 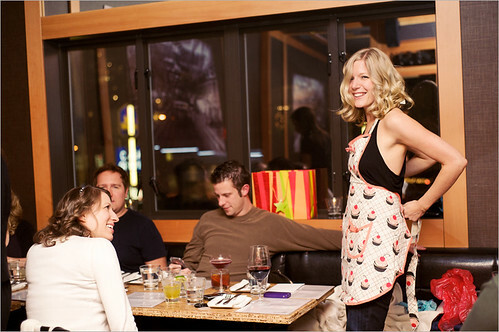 Much in thanks to a most excellent birthday gift from John Biehler, it all begins with one adorably covet-worthy apron. Did I mention that I love that it has pockets and bows? I suspect my newest toy will come in handy also. After a trip last night to Superstore, my kitchen is stocked with five pounds of butter plus flour, white sugar, brown sugar, icing sugar, berry sugar, white chocolate, milk chocolate, almonds, cream cheese, peanuts, eggs, mini Reese peanut butter cups, marshmallows, peanut butter and a truckload of ingredients necessary to whip up insanely good batches of nuts n’ bolts. My wallet is $103.72 lighter. Round 1 kicks off tonight with a batch of homemade caramel popcorn and luscious red velvet cupcakes topped with cream cheese frosting. Friday sets the stage for Round 2 with nuts n’ bolts and marbled almond bark with toasted almond chunks. The final round wraps up on Saturday with peanut butter cup cookies and buttery Scottish shortbread. To celebrate my triumphant win in the kitchen, the guy and I are toasting with rum and eggnog and a viewing à deux of Home Alone 2: Lost In New York that evening by the Christmas tree. There may be sampling involved. Over the last several years, the responsibility of baking has been passed on to me from my mom and aunt, along with the epic turkey dinner we I make each year. To be honest, I wouldn’t have it any other way. Something tells me I’ll have a hard time sleeping tonight, filled with excitement over the baking and cooking that awaits me in the coming week. You tell me: what are some of your favourite baked Christmas treats? Which holiday traditions are you responsible for in your family? I have also been given the duties of baking many of the treats. This year though I have had to adapt things because of my dietary change (GF/DF) so am making new recipes. Peppermint Bark is a family favourite that although I can not eat it, I am making it for the first year of I am sure many more. I LOVE baking…and cooking…let’s face it, eating too! We have a secret family recipe for lemon sherbert that we eat only on Christmas. I will be making it for the first time this year! 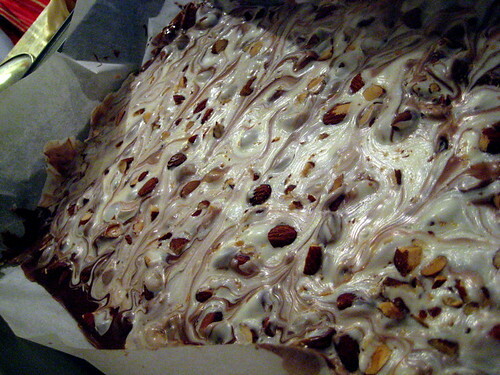 Holy Almond Bark – that actually looks saucy. You’re good, K-A. I’m Type 2 diabetic and just by looking at your pictures, my blood sugar went up 3 points. 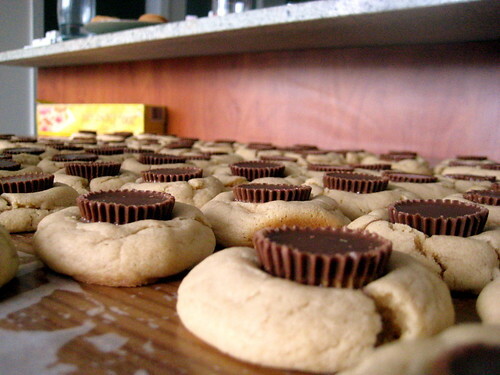 I think that I may need to mix up a batch of those PB Cup cookies this weekend. This post (and those photographs) are inspiringly delicious! There was a time that I used to bake at least 10 different batches of goodies for Xmas but it has been reduced to one…shortbread…and that’s because I have a lovely daughter who has taken over all the baking and cooking. Can’t wait! Tonight I will be making Chocolate Haystacks, Rebar peanut butter squares (again-they are AH-mazing) and sugar cookies to decorate later this week! Your list sounds epic and delicious! & that apron really is to die for! Just reading this made me get super excited about my own baking! Every year for the past 3 years I’ve been making traditional Ukrainian christmas bread, which is eggy, rich and delicious. it’ll get made sometime between now and Christmas Eve, since it tastes perfect the day after baking. And this Christmas I have a baking list as long as my arm that is a bit too ambitious. It includes nougat, lebkuchen, biscotti, earl grey tea shortbread, and a chocolate salami (which is not real salami, just chocolate and cookies shaped to look like salami and dusted with icing sugar). This week will be busy, to say the least, and fun, too. Happy baking!